"We are so very sorry to hear the sad news. Our thoughts are..."
"Much Love to you Margie and family. Debbie and Ed Hallow"
"So sorry for your loss. He was such fun to be with playing..."
"My thoughts and prayers go out to the Family and friends. 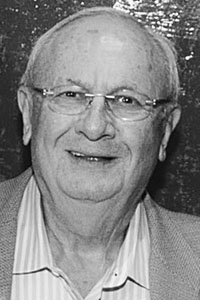 I..."
"DEAR MARGE AND FAMILY, WE ARE GOING TO GREATLY MISS THE..."
NAPLES - The Honorable James A. Goodman, of Naples, Maine and Boca Raton, Fla., passed away on Feb. 9, 2019, at the age of 82. He was a loving husband, father and papa to 10 grandchildren. Jim was born in Bangor on March 21, 1936 to Samuel Goodman and Hilda (Friedman) Goodman. He attended Hebron Academy, Tufts University and graduated from Boston University School of Law in 1961. His primary career focus was bankruptcy law, serving at times as an attorney, judge and a mediator/arbitrator after retiring from the bench. He served as United States Bankruptcy Judge for the District of Maine 1981-2001 and chief judge of the United States Bankruptcy Court for the District of Maine 1990-1997. Throughout his judicial career, he presided over courts in New York, Massachusetts, New Hampshire, Florida, Puerto Rico and Louisiana in cases involving a wide variety of industries. His later career involved many interesting and unusual activities, including holding a license to operate power plants by the Federal Energy Regulatory Commission. Educating others was important to him and he traveled to several countries to teach programs on bankruptcy in conjunction with his work with USAID, Meridian International, World Bank and numerous other organizations. Among his greatest loves was spending time in his workshop creating beautiful furniture for his family and friends. Baby cradles, rocking horses, poker tables, desks and an ark for the local synagogue to name a few. He enjoyed antique automobiles, and once restored two English automobiles, a Morgan and a MG TD. His other great love was his family and he cherished every moment he could spend with them. He is survived by his wife of 58 years, Marjorie (Golden) Goodman; his children, Lisa (Goodman) Stern, Joseph Goodman and wife, Hilary (Cooper) Goodman, David Goodman and partner, Felecia Cooper, Samuel Goodman and wife, Jennifer (Schatz) Goodman; and 10 grandchildren, Benjamin Stern, Matthew Stern, Jessica Goodman, Rebecca Goodman, Melissa Goodman, Ethan Goodman, Sara Goodman, Amy Goodman, Jack Goodman and Adam Goodman. He is also survived by three siblings, Michael Goodman, Ronda (Goodman) Grodberg, and Hannah (Goodman) Obstler. Services will be held at Temple Beth El, 400 Deering Avenue, Portland, on Tuesday February 12, at 2 p.m. Interment to follow at Temple Beth El Memorial Park, 1 Johnson Road, Portland. A reception will be held after interment at Falmouth Country Club. Shiva will be held at the home of Joseph and Hilary Goodman, 92 Alice Street, Portland, on Wednesday February 13, and Thursday February 14, from 2-4 p.m. and 6-8 p.m. and Friday, February 15 from 2-4:30 p.m.